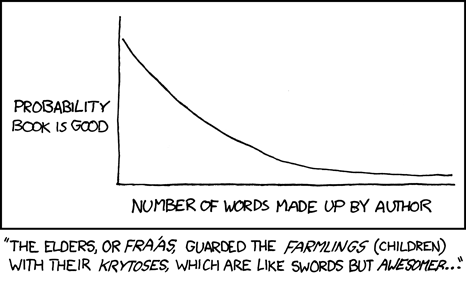 Working my way through Neal Stephenson's 'Anathem', and its pretty obvious that Randall Munroe at xkcd is as well. Its a massive tome, 800 pages or so, and the first chapter or two do their best to thrust the reader into Stephenson's mindset with some highly evocative language that skirts on the familiar, but aren't quite real words. Most of these get explained further on in the book through a dictionary reference that precedes each chapter, and in fact these references are often quite funny in and of themselves and serve a similar plot device to Robert Anton Wilson's footnotes on De Selby (possibly the greatest Irish philosopher to never live) in 'The Widow's Son'. Much, however, gets left to the reader to puzzle through like an EFL student grasping at meaning through association with context. However anyone who has read "Quicksilver" knows that Stephenson is more than capable of being linguistically obtuse without having to resort to creating new words. To tell anything of the plot would spoil some of the enjoyment of the book, but in spite of (or possibly because of) Stephenson's literary conceits I am enjoying it immensely so far. This creation of a new 'almost-like' language is interesting in it's use in film/television. So instead of bowing completely to the censors he created an entirely new vocabulary which allowed the characters to express themselves freely without fear of censorship. the only bad part of it was having to try very hard not to use 'Gorram' in real life after a Firefly Box Set marathon! In books (to get back to your original point) I'm not so sure - you're not limited like you are on screen with the volume of dialogue or description you can use so why not use the words we already have? There are quite a lot of them already! You probably saw this already, but roll over the image at xkcd to confirm the Anathem connection. @tpy - cool, I actually missed that 'cause I get xkcd via RSS. @kate - I don't think its polite to call Chinese a made up language. That's interesting. It showed up for me in Bloglines. Maybe other readers don't include the tags for pics?